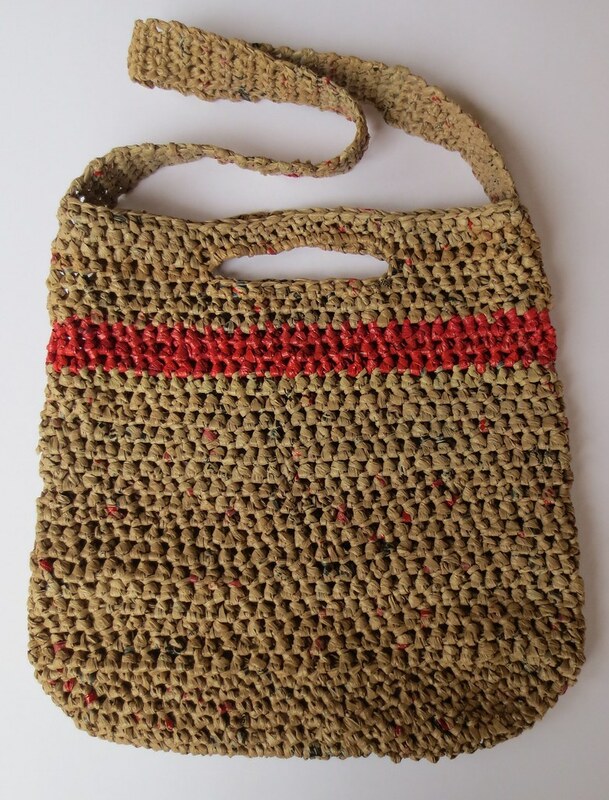 I followed one of my basic crocheted plarn tote bag patterns found here but with a few modifications. My changes were for the first six rounds, I worked single crochet (SC) stitches rather than half double crochet (Hdc). This gives the bottom of the bag a more dense and stronger base. At round 7, I worked in Hdc stitches and generally followed the pattern except for the grip handle, only worked 13 Sc around the handle chain so the handle would be smaller. Three rows of recycled plastic newspaper bags were added for the stripe. I recycled the newspaper bags using this tutorial that shows how to make plarn or plastic bag yarn out of the sacks. You just crochet with the plarn that same way as with the brown retail bags. The dual shoulder strap idea was taken from my jumbo dual handled tote bag pattern. The shoulder strap was crocheted using a K crochet hook. I attached at side and worked even on 5 SC stitches for 30 inches and attached to other side with slip stitches. By adding the shoulder strap, this reusable tote makes a great book bag or market grocery tote. Recycling plastic bags into new and reusable items has been a passion of mine for over 10 years now. If you are just discovering the world of recycled crafting please check out all my free patterns and tutorials for more ideas. Wow, this is such a great idea! This bag is so cool! This bag is very beautiful, and thanks for your sharing!